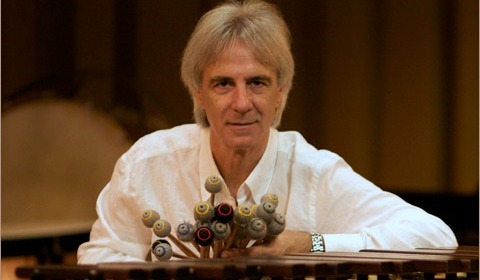 Ney Rosauro is recognised as one of the most original and dynamic symphonic percussionists and composers today. Born in Rio de Janeiro, Brazil on October 24th 1952, he started studying percussion in 1977 with Luiz Anunciação of the Orquestra Sinfonica Brasileira. Dr. Rosauro studied Composition and Conducting at the Universidade de Brasilia. He then received the Masters Degree in percussion at the Hochschule fur Musik Wurzburg in Germany under Professor Siegfried Fink. He completed his Doctorate at the University of Miami under the supervision of Fred Wickstrom. From 1975 to 1987 he was percussion instructor at the Escola de Musica de Brasilia, and timpanist with the Orquestra do Teatro Nacional de Brasilia in Brazil. From 1987 to 1999 he was head of Percussion Studies at the Universidade Federal de Santa Maria in South Brazil, where he also conducted the Percussion Ensemble. In 2000 he began his current position as Director of Percussion Studies at the University of Miami in Coral Gables, Florida, USA. This version for brass band of the most popular marimba concerto of all time is available exclusively from Alto Publications. The arrangement by David Danford was commissioned by EBBA for use at the 4th European Soloists Competition held at the Sir Adrian Boult Hall, Birmingham in 2007. The piece proved successful for marimbist Lin Chin-Cheng, winner of the competition. The lively final movement from the most popular marimba concerto of all time with brass band accompaniment. A great solo feature for any 4-mallet marimba player. Despedida was premiered by David Danford with the Tredegar Band in Cardiff in 2007. A version for brass band of Ney Rosauro's Concerto for Timpani arranged by David Danford. Throughout the three movements the lyrical potential of the timpani is explored and the soloist plays singing melodies rather than drum patterns.